English Professor Armando Prats said something that stuck in Elijah Edwards' head, "We are, in great measure, the living expression of our influences." It's a powerful sentiment that recent English graduate Edwards reflects in his own story. 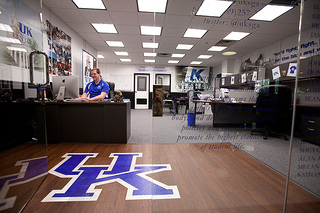 Edwards, a Kentucky native from Harrodsburg, came to the University of Kentucky in 2009 as a secondary English education major but quickly picked up two more: English and linguistics. That might seem like a lot to take on in four years, but for Edwards the workload was made manageable due to the nature of degrees from the College of Arts and Sciences, which help students explore diverse fields of knowledge. 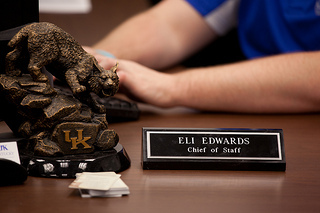 In the midst of all that, Edwards also served three terms as a Student Government Senator, one term as Senate President, and is now Chief of Staff for the executive branch. What most attracted Edwards to majoring in English, however, was the number of inspiring faculty filling the hallways. “I think that’s one of the best parts of the English department. We have a lot of acclaimed professors in their different fields as well as many published authors,” said Edwards. Once immersed in the major, Edwards found himself drawn towards a wide spectrum of topics within English, from war poetry and film with professors Pearl James and Armando Prats, to Kentucky literature. He found this latter area to be particularly rewarding because of the rich connection that the department’s faculty holds to the state’s body of letters. Yet, the act of discovering your own—whether it’s your written voice or what shape your life will take—is far from simple. That’s why Edwards appreciated one particular story Professor Prats told him during a discussion about his future plans.